This is a complex, work intensive dish, but the results are nothing short of spectacular, if I might say so myself. The rich buttery puff pastry holds a wonderful creamy base laden with succulent deeply wine-y caramelised onions. Topped with melted raclette, the tart is complicated, delicious and very satisfying. These were created as a tapas for the O’Gourmet Food Hall Spanish red wine tasting, and were paired with a beautiful, organic Crianza 2005. The onions were caramelised in an entire bottle of Crianza 2005, and cooked down into a thick jammy muddle for four hours. The puff pastry is simple, if you an find an all butter prepared puff pastry. If you cant, there are some amazingly easy recipes for foolproof puff pastry made with your food processor available online. Dont, under any circumstances, use puff pastry that is made with vegetable fat – it ruins everything! Part of the problem with tarts of this kind is that even though the top bakes up gorgeously, the bottom is often underbaked. I solved this problem by baking the tarts as per normal, letting them cool for a few minutes, taking them out of their muffin tins, and flipping them over onto a baking sheet. I then baked them again in a very hot oven for about ten minutes, until the bottoms were golden and crisp, and just as delicious as the tops! We must always have balance in cooking…as in life. I used raclette in this tart – a smooth very creamy melting cheese, often added to fondues. The cheese is rich and salty, yet mild. It compliments the onions, without overwhelming them. 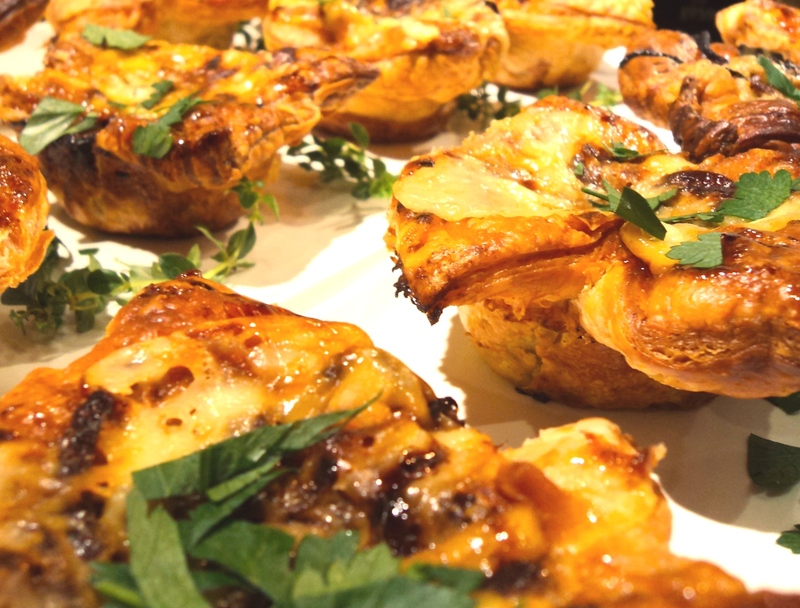 Baked into the tart the raclette melds with the onions and savoury custard into a molten cheesy joy. You can serve this tart warm from the oven, or at room temperature within 24 hours. The recipe for the onions makes more than you need. Any extra can be used as the base for a magnificent pasta, a grilled cheese sandwich, or to spark your cooking imagination! Makes 20 medium sized tarts. Do adjust for your own crowd! In a large, heavy pan, over medium low heat, melt the butter. While the butter is slowly melting, prepare the onions. Peel, cut in half (from stem to root), and slice thinly. I always keep root intact to hold the onion together while I slice it. Once the butter has melted, add the onions, and toss so that they are covered completely by the butter. Add about half a bottle of wine, the red wine vinegar, balsamic, sugar and a lot of pepper and a bit of salt. Stir well to combine, and cover the pan with a tight fitting lid. Reduce the heat a tad, and allow the mixture to simmer, stirring every ten minutes or so for about an hour. By the end of an hour or so, the onions should be stained dark red with the wine, and quite soft. Remove the lid, add the remaining wine, stir well, and allow to cook down for another three hours or so, stirring every half an hour to make sure the onions dont burn. You can judge when you feel they are ready, but do try and give them as much time as possible. They will turn a deep dark wine red. When the onions are ready, take off heat, and allow to cool to room temperature. Taste and adjust for salt and pepper. These may be kept, covered, in the fridge, for up to 3 weeks. Preheat the oven to 180C (350F). Spray a muffin tin pan with non stick spray (I used an organic canola oil). Line a large baking sheet with parchment or baking paper. The puff pastry should be quite cold, yet malleable. If you have made fresh puff pastry, make sure you pop it in the freezer for about 5 minutes before cutting it. Cut the puff pastry into squares larger than the width of the muffin tin and place one square in each. I like the squares with the edges rough and untamed. I tend to like these tarts look rustic, but if you prefer an ordered tart, by all means cut big rounds. Pierce the pastry with a fork all over (particularly the bottom), and bake in the oven for about 10 – 15 minutes until light golden. Meanwhile, whisk together the eggs and cream, season with a bit of salt and pepper, and place in a pouring jug. Once the pastry has been baked to golden brown, remove from the oven and let cool for a few minutes. Place a tablespoon or more of the caramelised onions in each tart, and pour over the custard mixture. Bake again in the oven for about 1o minutes, and then remove and top the tarts with the sliced raclette or other melting cheese. Bake again for a further five minutes or so, or until the cheese has melted and is starting to bubble, and the custard is just set. Remove the tarts from the oven and allow to cool for about 10 – 15 minutes. Remove from the muffin tins, and place onto the prepared baking pan upside down. Bake in the hot oven for a further 5 – 10 minutes, or until the bottoms are crispy and browned. Allow to cool for at least 10 minutes before serving, or serve at room temperature within 1 day. Tomorrow, Z’s first and greatly beloved au pair, Essia is leaving to go home to Germany. Essia has become part of the family, and today was one of those days of laughter and memory, tears and bittersweet melancholy. Its a time of change, not just for Z, but for M + B who watch their surrogate daughter leave with ache and love. I think its easier for babies … they love those who love them. Z is adjusting well to Julia, her new love… For the adults though… We have been through partings before, and we know the heart soreness that accompanies leave taking. We understand that change is a part of life, that loving and loss are intertwined. We accept it, but its difficult. It hurts. And there is not much that makes it better. We just have to live through it, and be thankful for knowing and loving one another. Essia is a special, bright and beautiful young woman, and her departure from this home will be felt deep down in its bones. But she will always be connected to Z, to us, to this family. We know that too, and we look forward to the joy of seeing each other once again. There isnt much that makes it better… but I can do the one thing I always do, during times of celebration and times of sorrow. I cook. So I made Essia dinner. At her request, Trader Joe’s Truffle brownies (which I jacked up a bit with a sinful amount of white and milk chocolate and some coffee from the pot). And this spinach pie. It was at once rich and comforting, and hopefully conveyed how much we love Essia and will miss her. Sometimes I am not good with words. Sometimes, when I want to offer a hug, I replace it with a pie. I did that here and I hope Essia knows how much she is beloved. This spinach pie had a secret ingredient. Underneath the spinach layer, I added caramelised onions, simmered in olive oil and balsamic, and a touch of sugar. 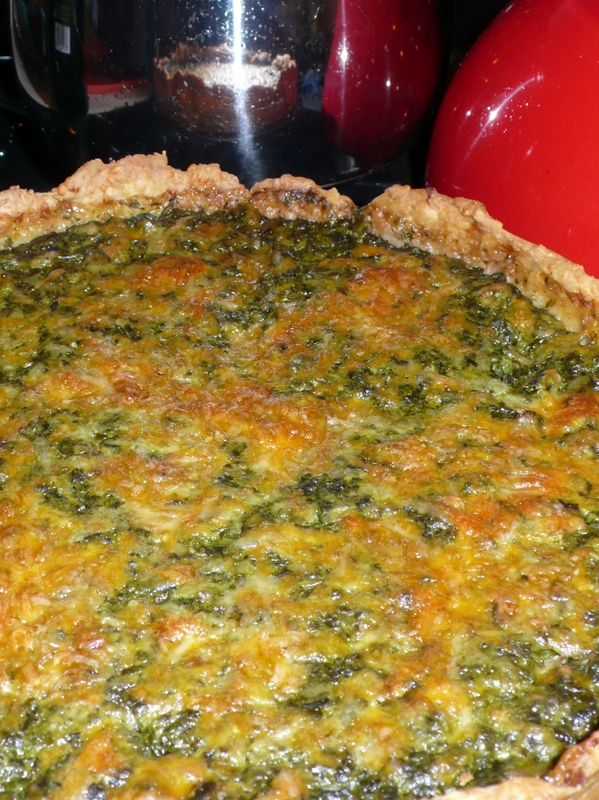 The onions softened the spinach and made the pie take on layers of love and missing. This pie made me happy too because it had the beautiful greens of the end of summer – when baked in the oven, the spinach goes dark emerald green. So gorgeous. With it, I served a simple salad of raw white corn, fresh and sweet, with chopped carrots and minced garlic chives and wheat grass. A simple balsamic vinaigrette just to bind the flavors. It was the perfect sunshiney juxtaposition to the pie. As we sat around the table and remembered life together, knowing that tomorrow will bring leave-taking, we were joined by our communal meal. It was such an honour to be able to provide it, not just for Essia, but for M as well. This pie will serve 6 – 8 people. I made it in a spring form cake pan (9 3/4″) but you can make it in a pie or tart pan if you like. I have also notated how to make this pie vegan – a few simple switches between butter and margarine for the crust, and soy creamer / coconut milk with the spinach. Enjoy with those you love. In a small bowl, toss together the flour, cheddar (or ground nuts), salt and oregano. Grate the frozen butter (or shortening) over, and toss lightly with your fingers. The mixture should resemble oatmeal. If you are making the vegetarian version, beat the egg lightly and mix into the flour mixture until the dough comes together. If you are cooking vegan, add the ice water, and combine until the dough comes together. Refrigerate for at least ten minutes to let the dough rest. Once the dough has had some time relaxing in the fridge, take it out and roll out on a clean surface. Transfer to your baking tin, and make sure the edges are even. Using the tines of a fork, poke multiple holes in the dough, making sure to go up the sides! Bake in the oven for 15 – 20 minutes, or until the crust has browned well. Set aside to cool. In a large, non stick pan, over medium heat, sautee the onions in the olive oil until they begin to soften. Season with salt and pepper, sprinkle over the sugar and a few tablespoons of balsamic, and bring the heat up to high. Cover the onions completely with water, and let the mixture come to a boil. Reduce the heat to low, and let the onions simmer until all the water has been incorporated, at least 15 minutes or so. Taste. Sometimes, if I want a deeper darker flavour (as I did here) I will do this a second time, adding more balsamic and more water, and simmering down again. The first time you go through this process, you will have quite distinct rings of caramelised onion. If you do it a second time, you will have almost jammy caramelised onion, sweet and thick and almost like a sauce. Thats what I wanted, so thats what I did. I leave it to you to decide depending on your sense of taste, and occasion. Once the onions are to your liking, set aside. In a pan or saucepan, heat the olive oil and saute the garlic until just softened, over medium high heat. Add the spinach, and stir until it wilts. You dont want to over cook it, but you do want to encourage it to let go of its liquid. Season with salt, pepper and paprika. Set a sieve over a bowl, and transfer the spinach to the sieve. Let the water drip through for about 5 minutes or so. You can encourage it by pressing down on the spinach solids. Discard the water, and transfer the spinach to the bowl. Add the cream, and taste. Adjust seasonings. Using an immersion blender (or transfer to a blender or food processor), cream the spinach well. You want it to emulsify, and you want the garlic and spinach to combine completely. It does not need to be totally liquidised… I quite like it a bit chunky. Add parmesan if you are using, and taste again for seasoning. You could add some chili flakes if you like a bit of a kick. Set aside. Preheat the oven to 190C (375F). Spread the caramelised onions all over the base of the pie crust. If you are using, sprinkle about half the grated cheddar over. Pour the spinach into the pie shell, and sprinkle with the rest of the cheddar. Bake in the oven for 45 minutes or longer. The pie is done when it no longer wobbles ferociously when shaken 😉 or when a knife inserted into the spinach comes out clean. Let rest for at least 15 minutes before serving. I prefer this at room temperature or even cold. Eat with love and loved ones. Enjoy the time you have together! Oh my goodness, this is superb. It elevates pizza (which I think is pretty high on the totem pole anyway) to sublime heights. 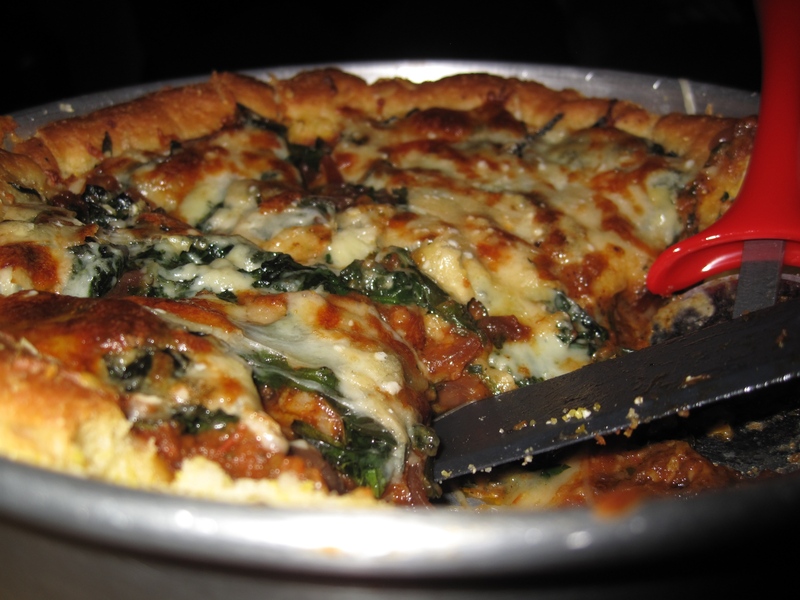 Its got a golden, nutty crust, oozing cheese, and superb toppings. I make two lots of the crust, and set out two different pizzas – a divine mushroom and onion, and a blue cheese, spinach and onion. Aiyoh. Heaven. Just about my favourite dinner, and I dont know why I make it so rarely. Its pretty easy with a bit of forward planning. You need to have certain ingredients at the ready: the tomato sauce (I use my own tomato sauce recipe but you could just reduce some onions, garlic and tomatoes with oregano); a couple of toppings – I used sauteed spinach (with just salt and pepper), caramelised onions, and sauteed mushrooms; cheese – a mix of mozzarella and parmesan is good; and your dough. Once you have everything set, making and baking the pizzas is a matter of half an hour. The dough is adapted from the Frog Commissary Cookbook… my favourite cookbook ever. Its very difficult to get durum wheat here in Malaysia, so I used very high protein bread flour. Also, its difficult to get semolina here (which is the rough version of durum wheat) so I decided I wanted a corn textured dough – I used polenta and fine ground cornmeal. Adjusting is the key – but you have to know what to replace and where. This gives you a nutty chewy delicious crust that holds its own against whatever you throw at it. Make sure to prep the dough at least 2 hours before you want to begin cooking. Dissolve the instant yeast in the warm water, and set aside for five minutes or so. Mix all flours with sugar and salt. Make a well in the centre, and pour the warm yeast and water, and the olive oil into the flours and mix well with your hands. You will have a soft dough. Knead a few times in your bowl. Make a ball, cover with a clean cloth and leave for at least half an hour to an hour to rise. Punch down, and use immediately, or refrigerate for up to 24 hours, and punch down and knead before use. Preheat oven to 200 C. Oil pan with a little olive oil and sprinkle polenta over. Roll put the dough – thinner in the centre, and thicker on the sides, and transfer to the baking pan. Use your fingers to push and pull and prod the dough so that it covers the entire pan, going up the sides. Make sure that it is thicker at the edges, and thinner at the bottom of the pan. Sprinkle about 2/3rds of the cheese along the bottom of the pie. Cover completely with tomato sauce. Spread the toppings over the pie. I made two pies. The first was with caramelised onions (about 1/2 cup) and sauteed mushrooms (about 2 cups). You need to saute or cook all the vegetables before adding to the pie because you do not want the vegetables to lose their water during baking. 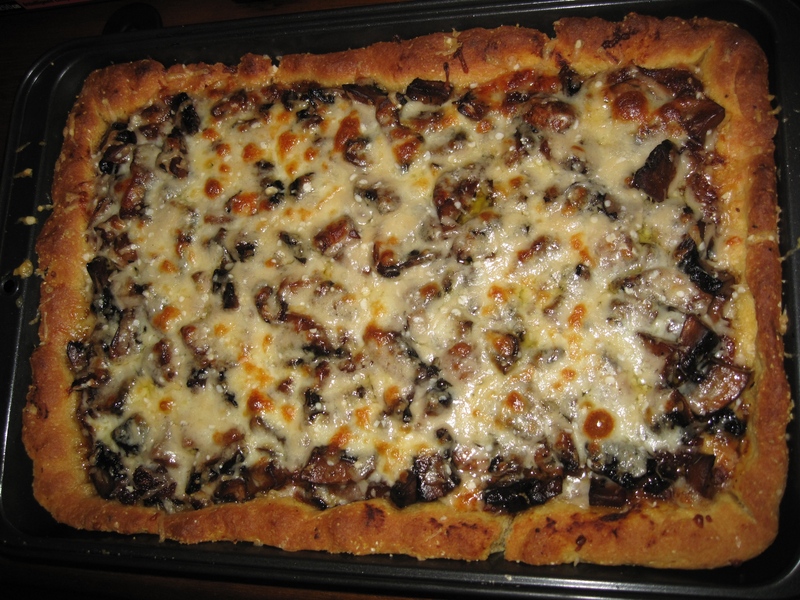 You will need to saute the mushrooms until they let go of their liquid before you add them to the pie. The second pizza was with sauteed spinach and caramelised onions, with a little blue cheese added to the cheese topping mix at the end. Put the pie in the oven for approximately 20 minutes, or until you see the edges begin to become golden brown. Take the pizza out of the oven, and sprinkle with the rest of the cheese. Let brown in the oven for a further 5 – 10 minutes. Allow to rest for at least 5 minutes once out of the oven. This is also wonderful cold, and makes a fantastic picnic!